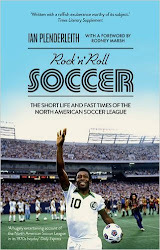 Wendy Parker's review of Rock n Roll Soccer at Sports Biblio last week highlighted the book's conclusion, where I write about the lack of personality in Major League Soccer compared with its fore-runner, the North American Soccer League. That's an aspect of the book that's been further thrown into focus this week as MLS concluded another season with yet another new champion, the Portland Timbers. All for the good, of course. Who doesn't like to see titles shared around? Who wants to be like Europe, where Barcelona or Bayern Munich win year after year? On the other hand, there's a major existential problem here for MLS. Commissioner Don Garber is never slow to talk about where his league stands in comparison with its European counterparts. He likes to set vague future goals about when MLS will be big, bigger and biggest. Last week he was talking up the rotating championship title as a reflection of "one of the most competitive leagues in the world". 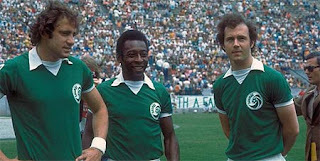 Yet when we think about MLS, what are the equivalent keywords to the NASL's feverishly listed Cosmos, Pelé, Beckenbauer, Best, Cruyff, Chinaglia? You can't answer back with 'parity' and expect to hold anyone's interest. But didn't MLS sign David Beckham? Wasn't that the league's Pelé moment? Beckham may be a polite and wealthy young man, but his on-field and off-field personality fell way short of making an impact the size of Pelé's. His former team, the LA Galaxy, may be five-times record champion, but they don't yet have the stature or the style - in any respect - to be seen as the North American domestic giants. They just happen to be the team that has won MLS Cup more than anyone else, without offering many thrills on the way. They also boasted the league's and the United States' best ever player, Landon Donovan, but he needed to be one of many. Instead, he was just one of one. Now he's retired, leaving Toronto's Italian striker Sebastian Giovinco as the league's sole outstanding player in 2015. In late October, I managed to get a ticket for Eintracht Frankfurt's home game with Bayern Munich. It's the only guaranteed sold out home game for Eintracht, and it's been that way for decades. Every right-thinking German soccer fan hates Bayern, and wants to see them defeated. Though in fact you could leave the word 'defeated' out of the previous sentence. Even as we despise them, we are fascinated at the way they can tear opponents apart with audacious attacking soccer. On the night, Frankfurt defended their asses off and grabbed a point in a 0-0 draw - the first points that Bayern had dropped all season. It's been a point of some pride in a mainly dire season for Frankfurt. Bayern Munich - hated, but talked about. Rich, hugely successful, and inversely popular. They are a globally massive team. Am I really saying that MLS needs a team like Bayern to win MLS Cup year after year? Not at all. 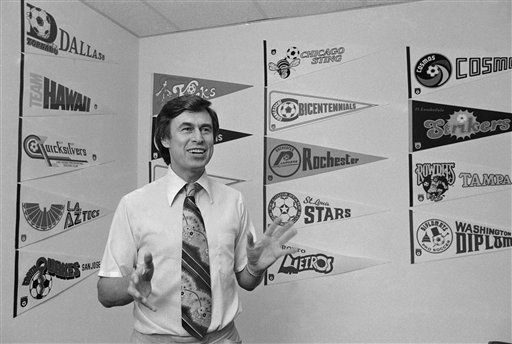 MLS could, however, urgently use four or five teams with some measure of Munich's magnetism. At the moment, parity means 20 clubs that vary from anaemic to presentable. There are still too many MLS games when the teams seem to think that the idea of soccer is to keep the ball as far away from both goals as possible. Importing veteran star names like Andrea Pirlo, Kaka, Steven Gerrard and Frank Lampard is a sign of stagnant imaginations in the league's front offices. These players won't make the league any worse, but neither they will they do much for its future. Eventually expanding the number of teams to 28, as MLS announced just this week, is making me feel tired as I type, and it's only nine in the morning. Phil Woosnam presents quantity over quality. Garber pointed out last week that "we’re spending almost $120 million on DPs [Designated Players]. That’s six times what we spent five years ago. So if we’re able to grow our business, our owners are going to spend more money. And it’s not just going to be on our core roster. It’s going to be on areas where we can spend more on players that will improve quality." To paraphrase the commissioner - spending money on big name players means the league will attract even more money, and then we can invest that in long term youth development. That's a leap of faith that's hard to quantify, even with the aid of corporate flow charts. As a Plan for the Future, it's lacking exactly what you would hope for in a plan for the future - a clear-sighted vision, and a cogent means of getting there. In the book's conclusion I generally show understanding for the MLS approach to building a league during those nascent years. Its caution, its prudence, and its need to develop in a way that will not frighten off new investors with concepts like relegation and bankruptcy. Yet, as that $120m figure above shows, parity and the salary cap have become fluid concepts according to the league's evolving needs. That salary cap isn't fooling anybody, and is increasingly meaningless when the league, with a ludicrous and shameless lack of transparency, will not even reveal its teams' profits and losses, transfer figures, or salaries (we have to rely on leaks, Forbes and the players' union for any of this information). What remains of parity's sham are the shackles preventing the emergence of teams with the kind of power and personality that - compared with the old NASL - is conspicuously missing. Still in place is a league more focused on its balance sheet than its league table and the quality of its play. A possible solution? MLS should stop trying so hard to control its own history. Quit setting grandiose goals, drop the business-speak, and cease caring about how it shapes up compared with Spain, England and Germany. Retire Garber - he's steered the league to security, but his job is done. Bring in someone (former deputy Ivan Gazidis?) who has a genuine feel for the game. Remove parity and let the clubs chart the league's history, mistakes and all. Allow supporters to develop a team's culture, not the marketing department. It wouldn't mean having to see the same team celebrate lifting the championship trophy year after year. The playoffs will prevent the dominant teams from serially winning titles and always give outsiders a chance. 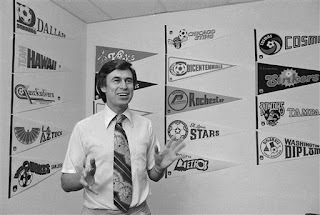 Even the mighty Cosmos only won four of the ten NASL titles between 1975 and 1984. They had charisma, but it was infectious. And as that league discovered too late - better a smaller, vibrant league than ill-conceived expansion for expansion's sake. An announcement for a new stadium and a team in Las Vegas which was met with welcoming words by MLS brought your book to mind. Atlanta next and then Minnesota and when will we recreate the old league.